As I waved goodbye to Matt from the motel parking lot, it dawned on me: if, for some reason, my friend Sean couldn’t make the drive up from the city that night so we could ski the next day as we’d planned — I’m screwed. I didn’t have much cell service, I didn’t have a car, I don’t even have a license. How would I get home? Wait around the whole week and take the Hunter bus back next weekend? Take a white-knuckle Uber ride back to Queens in some dude’s Camry? Do they even have Uber in Tannersville NY? I strolled back into the lobby of the infinitely charming and slightly ramshackle Green Mountain View Inn and figured I’d get into the leftover wine from our previous evening and all would work itself out. The universe provides; the universe loves skiing. Full disclosure, I’m not a skier who reads ski blogs. 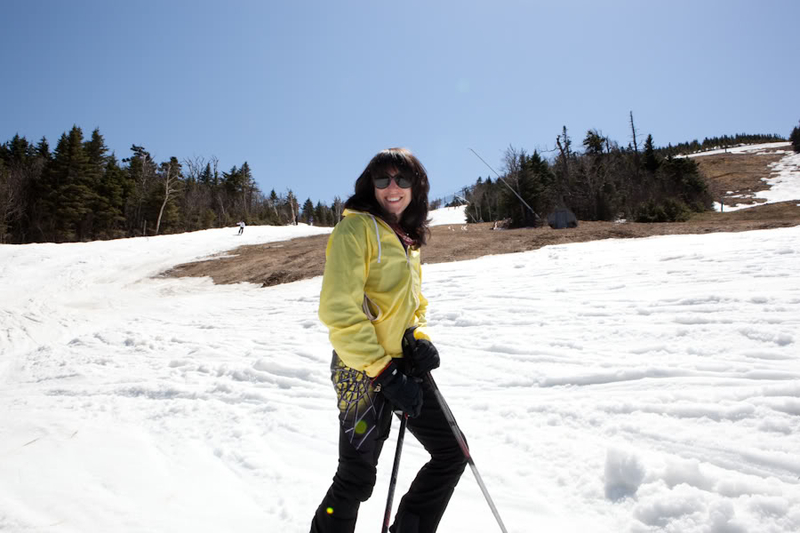 I’m a skier whose boyfriend, early on, put her on a pair of borrowed K2s, swathed in an old Spider racing onesie and his mom’s 90’s era boots and “compelled” her to ski Killington the last day of the 2009 season. Only good skiers ski on the last day of a season. Only a few trails are open, they are covered in slushy bumps and heck, it’s June. I was not a good skier. You can ski one run and start drinking beers around 11 AM at a ski mountain. Still I’ve had a great time and really grown to love skiing. And with many thanks to Matt, whose passion for skiing and the outdoors was the catalyst for me learning to ski and gaining my own formidable collection of gear. But you gotta cut the cord! I had a few extra days were I could take off to ski but poor Matt had to work, so I figured maybe I could get a little trip of my own going. I could do the planning and reading of snow reports, I could be the one to set the alarm clock and hustle the team out of the door; the hustler instead of the hustle-ee. One day, during our pre-shift chatter at the restaurant where I work discovered that my co-worker and dear friend Sean not only liked to ski, but grew up skiing in New York. He has a car and gets upstate for some shredding from time to time. The seeds of a plan began to germinate: Matt and I would do our weekend warrior thing and then I would meet Sean somewhere to be determined on Monday night. We’d ski Tuesday and drive back to the city together. But where to go? My priorities for a great day are probably different from those of advanced skiers. I only have so much time. I know I’m not going to have a 50-day season, so I want to have as much fun as possible with little fretting over what the conditions. I’ve enjoyed chasing snow with Matt and I like challenges, but for my little solo trip I just wanted to have fun. Matt and I took off for a mini-safari, skiing Plattekill Saturday (great conditions, one of the best days I’ve ever skied there) then Hickory we hit on Sunday. 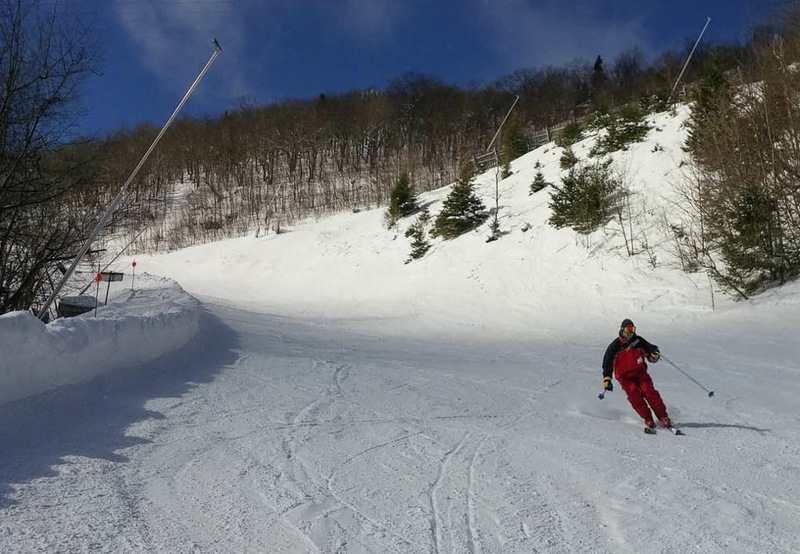 Monday was a frigid one at Gore. So for the last day 0f my weekend I just want to chill, more figuratively. 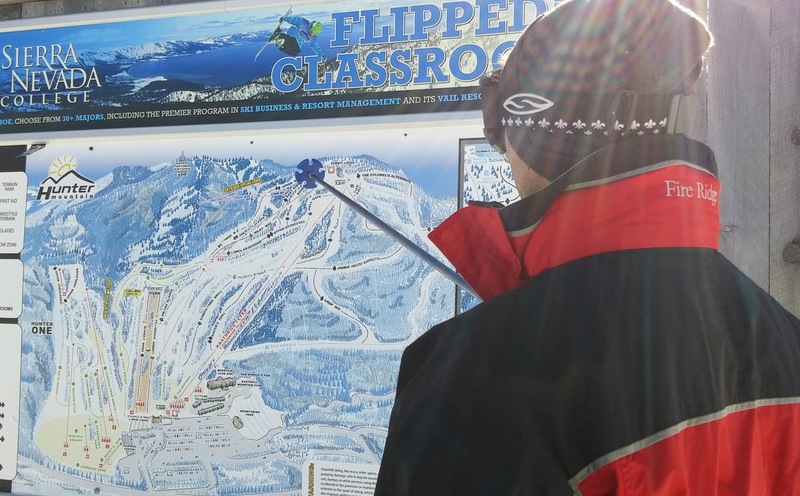 I wanted a few inches of fresh on top of expertly manicured groomers, plenty of open terrain (some of it challenging) so you feel like you’re exploring a mountain and beautiful scenery. And let’s try and keep it three hours from home. Oh yeah, and a good bar. We made the call: Huntah! We pulled in at a leisurely 9:15 beneath a bright blue sky, the air alive and shimmering with snow crystals. A couple of inches had fallen in the early morning. The weather was nearly perfect for February, no wind, around 20 all day. It felt almost too good to be true. 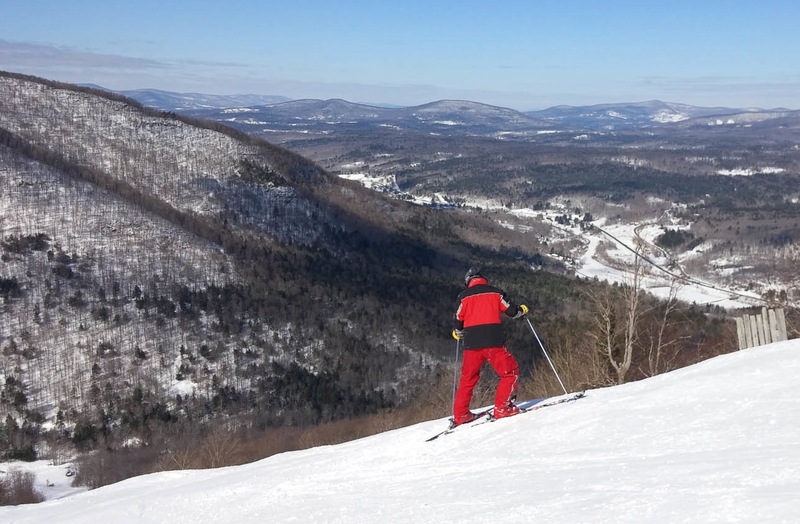 Sean has been on skis since he was six months old, schooled by his old-school dad in that hard-scrabble upstater style and he can rip. And Hunter is great for that. The grading of the trails is done so well you can pick up wicked amounts of speed before you start feeling like you might be entering a time warp. I was having so much fun trucking down the mountain behind Sean that I felt like I can take on some new trails, so we made our way to Hunter West. Way Out was in great shape and a total pleasure. Back at Hunter ‘East’ I had a blast lapping K27. Sean gravitated to the bumpier runs like Hell Gate and I even made my way through the Milky Way glades. (I usually avoid glades of any kind, because there’s like, trees in there and stuff.) On my last run of the day Beltway showed no signs of scrape at all, with pockets of loose snow to slide through all the way down. We earned our apres-ski beers. I love the vibe at Hunter, especially considering how popular it is. Sean was definitely not alone on his K2 Merlins; you don’t need this season’s fancy powder boards to be a superstar at Hunter. 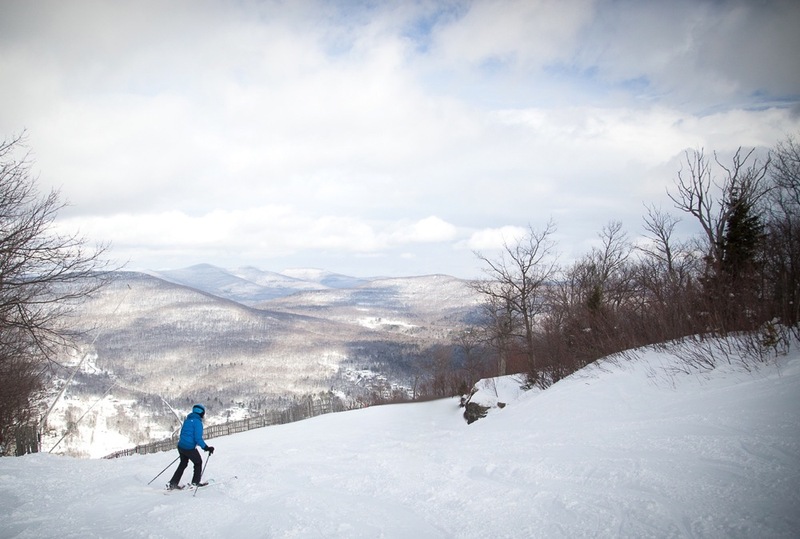 The place is full of east coast skiers who get up early, pack up the kids and the gear they’ve had for years, and shred. Every time I see some 5-year-old mainlining it, solo down Minya Konka in a semi-pizza, it makes me smile; that kid will grow up loving to ski. And then she’ll be the one trying to get her future boyfriend into the powder. The featured photo is mis-captioned. That’s not Hellgate. Glad you had a great time though. Hunter is great during the week!!! Yes!!! Great story…I could have written it 30 years ago, and now I live it!!!! Very nice story experience in Hunter Mountain.